Visible in this video at 1:17:06. Valhalla's plugin can be seen at 2:45 in this video. Kurstin [states](http://www.audiotechnology.com.au/wp/index.php/wigging-out/) that he processed the main bell synth in the intro of *Chandelier* with Valhalla Vintage Verb to give it some space. This Plugin can be seen at 10:31 in this Facebook video, uploaded by the artist himself. "If you're in the market for a good reverb plug-in, this is the one to get." 38:53. "My first reverb was a guitar effects pedal… a piece of crap. Now, I've got Valhalla [DSP]. I've seen people talk about it in the tech mags before and, yes, it really is that good! Shimmer and VintageVerb is on everything I do, from the smallest touches to the huge sweeps that can take a song way off into the distance." 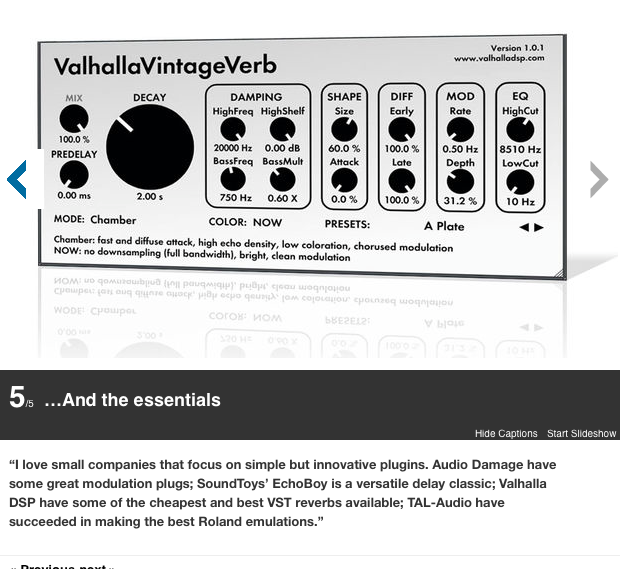 "Valhalla DSP have some of the cheapest and best VST reverbs available," says Joris, in [this article](http://www.musicradar.com/news/tech/joris-voorns-favourite-music-software-613667/5). In this video at 19.40 he is using vintageverb plugin. Seen used in Hoodboi's Instagram story. He shows it very shortly at 5:54 while explaining a mixing chain from his song "Floating Through A Frozen Atlantis". This Plugin can be seen at 0:17 in this Facebook video, uploaded by the artist himself. First visible in this video at 5:49. At 3:15 Frank says "Yeah just our go to Valhalla vintage reverb, it's just always great. Just to give it some effects, open shape"
My thoughts on Valhalla VintageVerb. If you want dark, rich-sounding reverbs this is the plugin to use. Absolutely stunning sound quality, whether you're using it for a light dash of reverb to give any instrument that special "mojo" or going crazy with 100% MIX settings for special FX purposes. This plugin will give you the "lonely clean guitar tone" used by Mikael Akerfeldt when used with the right settings and a PRS guitar. Such a wonderful sound! Valhalla rocks! My absolute favourite reverb engine. Very simple, very nice sounding. When someone asks me what reverb they should get, not matter if they're a new producer or someone who's been doing this for a long time, I will always recommend this. I own a plethora of other reverb plugins. I have the Reflektor, the Waves IR1, the Waves TrueVerb, the UAD Lexicon 224, and the UAD AMS RMX16. A majority of those reverbs cost hundreds of dollars, however this $50 plugin just continues to make me smile every time I load it up. This is always the first reverb I use in a project. For just about everything. Sometimes I take a break to use the RMX16 but this is the one for me. Lush, Ambient, Real, Mod, Versatile and Simple. My feedback is this really goes in depth in reverb. I suggest getting this plugin because it gives a really clean mix in your tracks. It can be easy to work with. This is a great plugin which has a unique sounding reverb. Works really well! "One of the top three atmospheric Lexicon style reverbs in the box"
"I've grown to love some of the custom programs I have been able to make with this plugin. What I love most is the user interface and it's minimalistic design. Being a person who worked for years on Lexicon 224, 480L and PCM 70 through 92, I can really appreciate how Sean Costello of Valhalla has found a way to make the Lexicon sound more ready, willing and able than it ever was. This software is fun!" I'm such a fan of Valhalla reverbs but this one seems to be my fave/go-to. It has a very nice sound and the interface is very quick and easy to understand. Very good bang for the buck, brilliant performance of sound, awesome design and great presets. I mainly use Ableton's built-in reverb on individual sounds, but I use VintageVerb on a return as a sort of "glue" verb that I route tons of stuff to, saturate & filter and then sidechain compress the living sh*t out of. The algorithms all have very distinct sounds and the GUI is so rad.